SRIMAD NARAYANEEYAM is the story of Lord Narayana. It is a work consisting of 1036 slokas or verses, divided into 100 dasakams or chapters, each dasakam consisting of approximately 10 slokas. Composed by Melpathur Narayana Bhattatiri, it is a condensed version of Srimad Bhagavata Mahapuranam, which consists of 18,000 slokas authored by Veda Vyasa (Bhagavata-artha-sangraha). It is said that the work has the blessings of Lord Krishna or Guruvayoorappan, the presiding Deity of the shrine of Guruvayoor. Iam posting this article Srimad Narayaneeyam 100 Dasakams or Chapters - MP3 Audio & Document because of the request from Mr.Ganesan.V. As the story goes, the author, Melpathur Narayana Bhattatiri voluntarily transferred onto himself, the ailment of paralysis from his Guru and relative, Trikandiyur Achuta Pisharoti ritualistically, in order to save him. In the process, he himself became a paralytic. He then got himself carried to the shrine at Guruvayoor where he could take shelter at the feet of Lord Krishna and get divine intervention. As he was continuing to suffer from excruciating pain due to his malady, he sought advice from the celebrated contemporary poet, Thunjath Ezhuthatchan, who suggested that Bhattatiri should “start with the fish”. 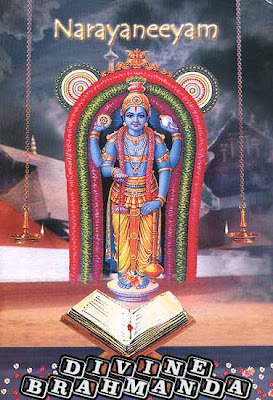 Bhattatiri, being quick to understand the implication of this suggestion, viz., that he should compose a hymn in praise of Lord Guruvayoorappan giving an account of all His sportive incarnations beginning with the incarnation as fish (Matsya-avatara), he sat at the feet of the Lord and composed this great work, a dasakam a day, with ardent devotion. At the end of the hundredth day, when he had completed all the one hundred dasakams, it is said that he had a glorious vision of the Lord and he was completely cured of his ailment. Bhattatiri composed Narayaneeyam when he was twenty-seven, completing it on November 27, 1587. This work, composed in praise of Lord Krishna, and which is said to have received divine intervention at different stages, is considered to be a short and sweet substitute for Srimad Bhagavata Mahapuranam and is recited by devotees all over the world as a general prayer and also as a panacea for all ailments causing impairment or loss of motor function of nerves. Innumerable devotees flock to the Guruvayoor temple and offer worship to the Lord, reciting this hymn of prayer in the firm hope, belief and trust that they would be cured of their ailments. I bow in front of you for such a nice work done by you for all the mankind. Unable to download the file "Srimad Narayaneeyam 61 - 80 Dasakams". The link seems to be broken. Please look into. Can i know who has sung this Narayaneeyam which you have uploaded? Kindly note that Dasakam 24 in the RAR file is not a actual mp3 file. Please provide link to Dasakam 24. My namaskarams/vandanam for such divine Attitude to bring Nararayaneeyam to all mankind.ThanksGuruvayurappane saranam.